There are different ways to climb the social ladder. There are different ways to rise above others to get rich. But killing your competition? Eight of them, in fact? That’s a whole different matter. In the musical comedy, “A Gentleman’s Guide to Love & Murder,” making a brief visit to the Hippodrome to close out 2016, we get to see just that. Darko Tresnjak, known for his work in Shakespearean plays, holds nothing back in directing this hilarious Edwardian farce. The production is aided by sturdy performances surrounding a cleverly crafted plot and score. A brilliantly detailed Victorian-style stage within a stage designed by Alexander Dodge serves as the set for the vast majority of the action. Exceptionally creative and colorful projection imagery in the rear includes smoke drifting out of factory smokestacks in 1907 England, clouds floating by and other similar devices that enhance the real-time feel during the numerous scene changes. 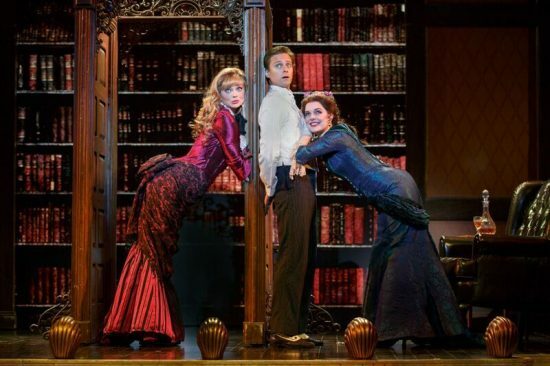 “A Gentleman’s Guide to Love & Murder” won a host of honors highlighted by four Tony Awards in 2014 including Best Musical. It features a book and lyrics by Robert L. Freedman and music and lyrics by Steven Lutvak. It is based on the 1907 novel “Israel Rank: The Autobiography of a Criminal by Roy Horniman,” which also was the basis for the 1949 British film “Kind Hearts and Coronets” that starred Alec Guinness. …sturdy performances surrounding a cleverly crafted plot and score. With tongue firmly in the cheek, the audience learns from the outset that the show could be uncomfortable if they have a “weaker constitution,” and if so, they should go. Indeed, there is a serial killer on the loose, but with the exception of a couple of killings, there isn’t much gore, so don’t take the bait. Stick through it and enjoy this witty laugh-a-thon. Monty Navarro, a poor Englishman, (played wonderfully by Kevin Massey) just learned from a woman named Miss Shingle (Mary VanArsdel) that his recently deceased washerwoman mother was actually a member of the aristocratic D’Ysquith family. She had been banished, however, when she defied the family wishes and eloped with a Castilian and worse, a musician (also deceased). Mom never told her son about his true ancestry, but Miss Shingle informs him that he is ninth in line to inherit the earldom of Highhurst and encourages him to take his rightful place in the family. Oh, the possibilities! Realizing his dream for success is only eight bodies away, Monty proceeds to off all those ahead of him in the line of succession in various and sundry ways. The methods he uses are bizarre and creative and seem to fit the personality or livelihood of the victims to a tee. For example, a “bulging” bodybuilder Major Lord Bartholomew D’Ysquith perished when Monty allowed an over-weighted barbell to fall hard on the unsuspecting soul’s neck. Guess what rolled to the gym floor? A flamboyant Henry D’Ysquith who was married but is clearly enamored by men is also a beekeeper. Monty sprays a lavender perfume on Henry’s beekeeping clothes knowing that it attracts bees—so many, in fact, that the victim dies from a thousand stings. Special effects comically show the swarm chasing Henry until his demise. There are more, of course, including the most gruesome of all—the fall from a bell tower by Reverend Lord Ezekial D’Ysquith—but it’s best to just leave you with these teasers. Monty writes all this in his journal while in jail two years later after he is arrested for the murder of one of the victims, which ironically was the one death for which Monty was not responsible. During the ensuing carnage, Monty had fallen in love with Sibella (Kristen Beth Williams), a social-climbing, self-centered beautiful woman. He also encounters a more down-to-earth but equally pretty Phoebe D’Ysquith (Kristen Hahn) who is not above him in the line of succession. He is faced with a difficult choice. A twist at the end is better left unmentioned here. The musical is unique in that all of the D’Ysquith victims are played by a single actor, John Rapson, who delivers a magnificent tour-de-force performance. Some fourteen costume changes are needed for Mr. Rapson alone. Not only does he cleverly take on the essence of each ill-fated character—male and female—but he deftly uses a variety of dialects and personalities to portray them. However, the show-stopping number “I’ve Decided to Marry You”—a zany, high-energy song with Mr. Massey, Krisitn Hahn as Phoebe and Kristen Beth Williams as Sibella—is a dandy and brought down the house. The remainder of the company, the technical crew as well as the orchestra under the direction of Lawrence Goldberg support the leads quite ably. A special nod goes to Linda Cho for the outstanding period costumes, especially the richly colorful floor-length gowns worn by the ladies. The eye-opening workout costume worn by the bodybuilder Major Lord Bartholomew had the audience laughing so hard. “A Gentleman’s Guide to Love & Murder” is a lavish, well-directed, immensely funny production that deserves the accolades it had received on Broadway. 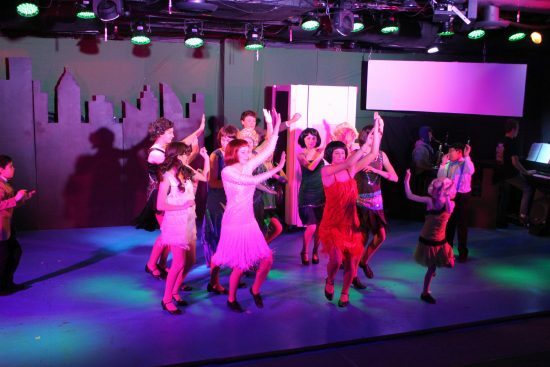 The touring company does the show justice and more and should not be missed. “A Gentleman’s Guide to Love & Murder” runs through January 1 at the Hippodrome Theatre at the France-Merrick Performing Arts Center, 12 N. Eutaw St, Baltimore, MD 21201. 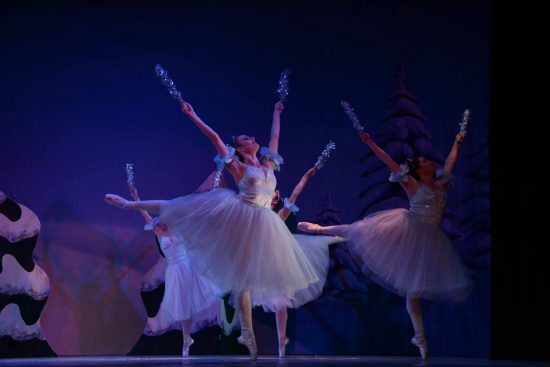 For tickets, call Ticketmaster at 800-982-ARTS or visit ticketmaster or the Hippodrome Theatre .